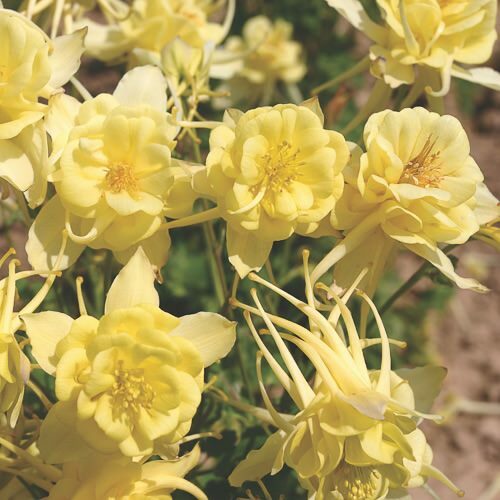 Sunshine columbine lights up shady spring borders with sunny yellow, double blooms decorated with elaborate, 2 in. long spurs. Blooms reach 2-3 in. across, and are held on long, sturdy, 24 to 28 in. stems. Sunshine columbine is an excellent cut flower, lasting up to two weeks in your vase. The fern-like plants continue to flower into mid summer, well after other columbines have finished. Mass planted, such is Sunshine's intensity and impact, it will bring to mind magnificent drifts of daffodils. A Fleuroselect Approved Novelty winner.